The pope visited the island of Lesbos alongside the spiritual leader of the world’s Orthodox Christians and the head of the Church of Greece to highlight the plight of refugees, thank the Greek people who have welcomed them in, and to show a united Christian response to the humanitarian crisis unfolding. The Vatican is already hosting two refugee families, so the gesture would be in keeping with Francis’ call for Europe to open its hearts and borders to those most in need. Many refugees fell to their knees and wept at Francis’ feet as he and the two senior Orthodox leaders approached them at the Moria detention center on the Greek island of Lesbos. Others chanted “Freedom! Freedom!” as they passed by. Francis bent down as one young girl knelt at his feet sobbing uncontrollably. A woman told the pope that her husband was in Germany, but that she was stuck with her two sons in Lesbos. In his remarks to them, Francis urged the refugees to know that they are not alone and shouldn’t lose hope. He said he wanted to visit them to hear their stories and to bring the world’s attention to their plight. “We hope that the world will heed these scenes of tragic and indeed desperate need, and respond in a way worthy of our common humanity,” he said. Francis’ Alitalia charter touched down at the airport in Lesbos shortly after 10 a.m. Saturday. Greek Prime Minister Alexis Tsipras met him on the tarmac and Francis thanked him for the “generosity” shown by the Greek people in welcoming foreigners despite their own economic troubles, the Vatican said. They lunched with eight refugees to hear their stories of fleeing war, conflict and poverty and their hopes for a better life in Europe. Later they were expected to pray together, tossing a floral wreath into the sea in memory of those who didn’t make the journey. The Vatican insisted Saturday’s visit is purely humanitarian and religious in nature, not political or a “direct” criticism of the EU plan. 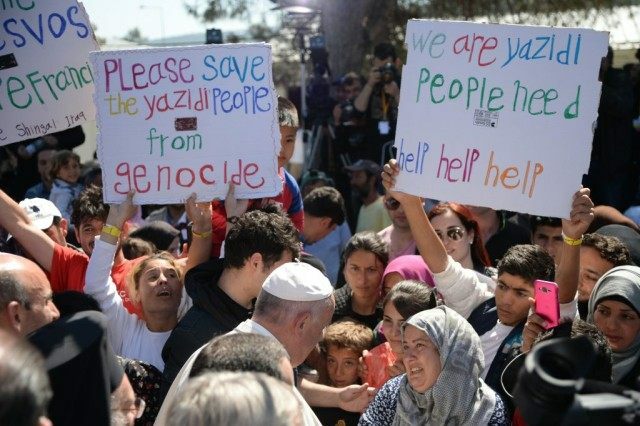 However, the Vatican official in charge of migrants, Cardinal Antonio Maria Veglio, has said the EU-Turkey plan essentially treats migrants as merchandise that can be traded back and forth and doesn’t recognize their inherent dignity as human beings. The pope’s trip to Lesbos also has a significant religious dimension. The Vatican spokesman, Lombardi, said the ecumenical significance of a meeting between Francis, Ecumenical Patriarch Bartholomew and the head of the Church of Greece, Athens Archbishop Ieronymos II was “obvious.” He credited Greece’s politicians with their willingness to let the religious leaders take center stage as an “appreciated” gesture of discretion. Winfield reported from Rome and Becatoros from Athens.